In April 2018, California’s top court officially made it more difficult for employers to designate their workers as independent contractors. The case which set the new rules for classification is Dynamex Operations West, Inc. v. Superior Court of Los Angeles, No. S222732 (Cal. Sup. Ct. Apr. 30, 2018). This landmark case brought about important considerations and new rules which have broadened who could be defined as an employee by the Employment Development Department (EDD). Simply stated, the Dynamex case brings new standards for the employee versus independent contractor analysis; therefore, if you are in any doubt about how to classify your workers, do reach out to us at Dallo Law Group to set your mind at ease. We also are happy to assist in any other wage and hour issue. Work statutes can be cumbersome and hard to interpret as well as understand how they impact your business. There is never a reason to remain in the dark on these crucial topics. During this past decade, the hiring of workers as independent contractors — not subject to government rules on minimum wage, overtime and rest breaks — has grown exponentially with an estimated 13 million such individuals in the United States. 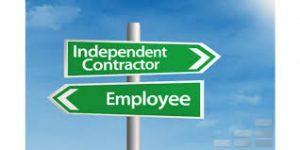 It seems only inevitable that new court cases would emerge that would challenge the classification of who is really an employee versus who is an independent contractor. Later in 2018, the Garcia v. Border Transportation Group, LLC case was argued in the California Court of Appeal. It was determined that Dynamex’s ABC test would not apply to claims not arising under a wage order which are adopted by California’s Industrial Welfare Commission (IWC). Because there is now uncertainty regarding the test with claims that are not brought under a wage order, the Dynamex Court left those for further consideration. Dynamex proved to be a landmark case in how to determine classification for an independent contractor. Then the Court of Appeals’ ruling in Garcia gave further helpful details as to scope and application of Dynamex to California employers. Now more than ever, it is vital that employers closely examine whether their existing independent contractor classifications conform to the new and more rigorous California standards. Employee versus independent contractor analysis is a tricky area of law. If you have any doubts or need assurances that you and your business is conforming to state law, do not hesitate to reach out to us at Dallo Law Group. Our attorneys are up-to-date and knowledgeable on all the latest California wage-hour law cases and how they can impact your bottom line. There is really no need to lose sleep over questions that can easily be answered for you. Dallo Law Group provides the highest level of expertise and professionalism in the areas of law and tax. Feel free to set up an appointment through our website at any time to meet with one of our team members. We will contact you as soon as possible to discuss your questions and concerns. As always, we look forward to hearing from you.